Claudia Bishop’s perfect life fell apart when the aftermath of a brutal assault left her with a crumbling marriage, a newborn daughter, and a constant sense of anxiety about the world around her. Now, looking for a fresh start with a home restoration project and growing blog, Claudia takes on a crumbling old house–one that unbeknownst to her has an ugly history and may hide long buried secrets. For Zoey Drake the defining moment of her childhood was the horrific murder of her parents. Years later, she has embraced the rage that fuels her. Training in the martial arts has made her strong and ready to face the demons from the past–and within. Strangers to each other, and walking very different paths in the wake of trauma, these two women are on a collision course–because Zoey’s past nightmare and Claudia’s dreams for her future take place in the same house. As Zoey seeks justice, and Claudia seeks peace, both will confront the terrifying monsters at the door. 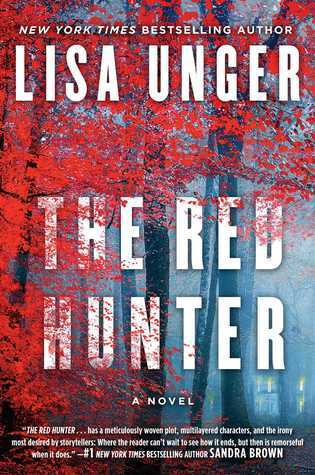 This is the first Lisa Unger crime fiction I’ve read, although I see she is a well-established US writer of crime fiction with strong female characters, including several series. The Red Hunter is a stand-alone novel. I live in Cairns but work often in Sydney or Melbourne, both three hour flights from home and therefore the perfect length of time to finish a good crime fiction read. I set aside The Red Hunter for my most recent flight from Melbourne to Cairns. There are two main women characters, Claudia and Zoey; Zoey, although this is not immediately as clear as it should be, is in fact the Red Hunter of the title, seeking justice on several fronts including her own family’s. Initially the two women are unknown to each other although each has suffered a horrific assault in the past. Claudia, a single mother of a rather wayward teenage daughter, has moved out of New York City to rural New Jersey to renovate a dilapidated house. Zoey has family and history that bring her back to this wooded area and the isolated house. There is unfinished business involving a million dollars stolen from a drug dealer, corrupt cops, and various local characters, one of who has just been released from jail. The denouement takes place in the house when these assorted characters meet, by a series of co-incidences that rather stretch credulity. Claudia and Zoey are both well-developed and engaging characters; Zoey has exceptional martial arts skills which are (reasonably) credible considering her life experience. The book moves along at a good pace and there are various back stories that kept my interest up as we flew over New South Wales and southern Queensland. However I felt the outcome was fairly predictable, given that there were only a very few characters who could have been the guilty parties in the original plot against Zoey and her family. It wasn’t too hard to work out the inevitable ending. And the addition (spoiler alert) of arson and a hidden tunnel were not terribly original props along the way. That said, I found I easily filled in the flight time until we began the descent into Cairns, and conclude that this is a good airplane read. I might try one of Unger’s series next.